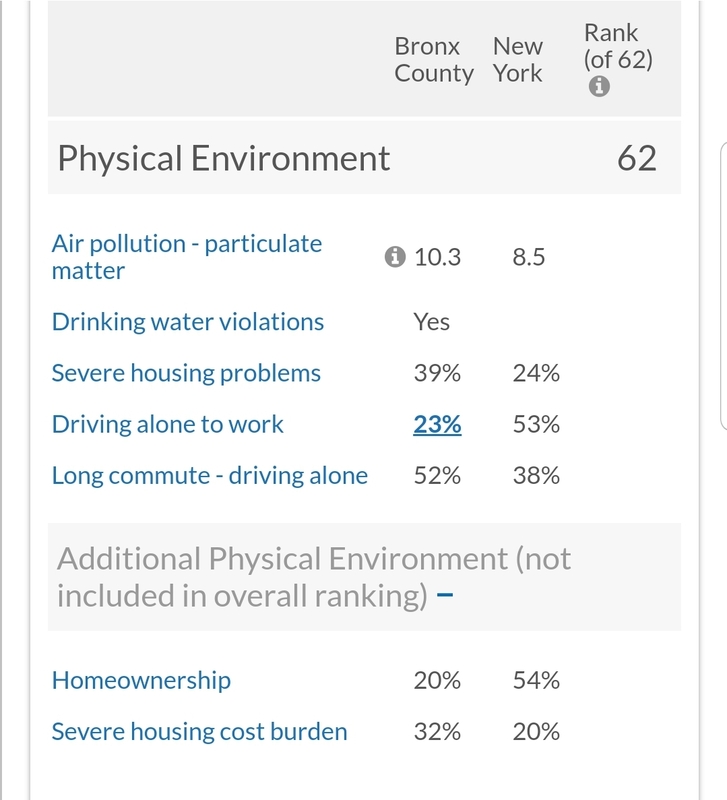 Despite all the campaigns to end The Bronx’s ranking as New York State’s unhealthiest county, our borough came in dead last once again. 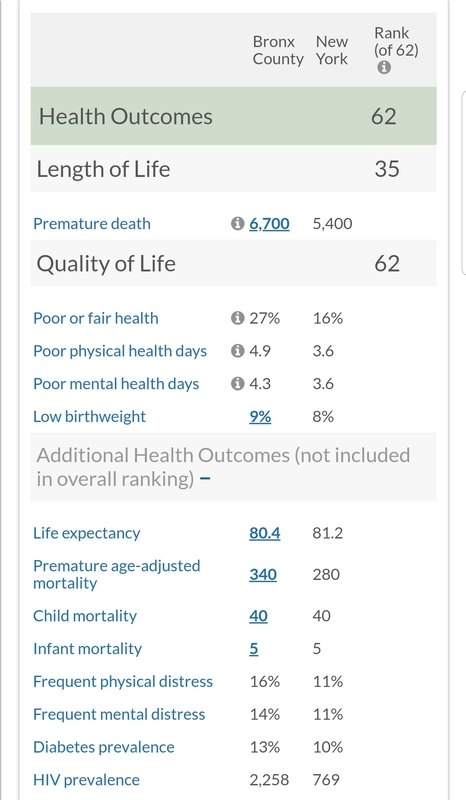 What’s worse is the glaring disparity when just across the river, Manhattan is one of the healthiest in the state and the average life expectancy is higher at 84.5 compared to The Bronx where its only 80.4. This isn’t surprising to many Bronxites who live the realities of the findings of this latest report on a daily basis. 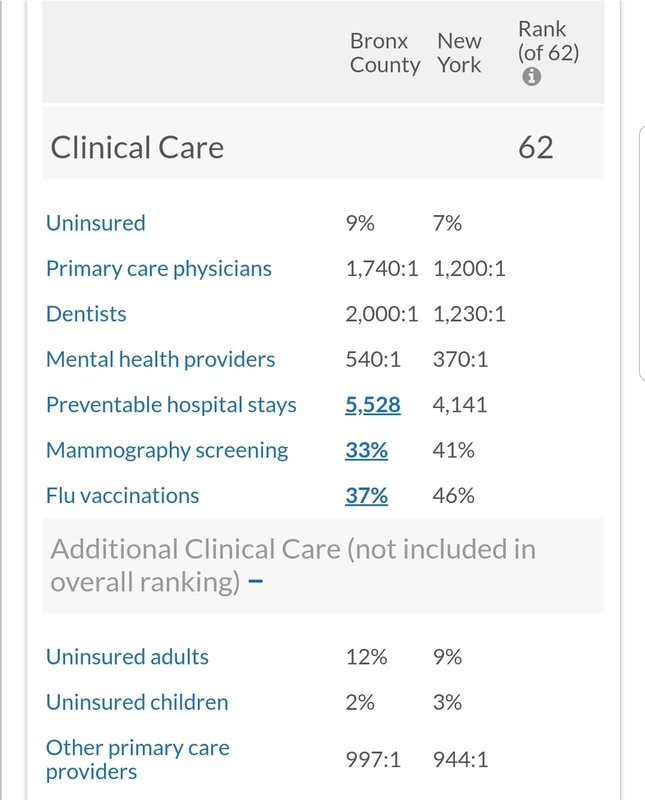 The report also cites that when it comes to clinical care, The Bronx comes in dead last with less access to primary care physicians, dentists, and mental health providers than the state average. Add social and economic factors to that and we also come in last at 62nd place with indicators such as children living in poverty at 39% versus the state average of 20% and a higher rate of violent crime despite the huge progress we’ve made in the past 20 years. As for environmental factors? When you factor those in it’s a recipe for the disastrous state of health in our borough. We have a higher rate of pollution and 39% of the population has severe housing issues compared to 20% for the state. Our borough is still in a health crisis after almost a decade of these reports but what have our elected officials done about it? It isn’t a big secret that we’re lagging behind the rest of the city and state so why don’t we have more funding to help mitigate some of these health disparities? We need our elected officials to do more than just a hashtag campaign of #not62. Let’s get more funding to help with these outcomes. You can read the full report here and check out how other counties did.